BJ Blazkowicz prepares to spark a second American Revolution in the show-stopping first trailer for Wolfenstein II: The New Colossus, Bethesda and MachineGames’ shooter sequel that is now set to light up PS4, Xbox One, and PC on October 27th. Set against the backdrop of 1960s America – cue the comparisons to The Man in the High Castle – The New Colossus will hew close to the story of MachineGames’ cult series by exploring an alternate timeline in which the Nazis emerged victorious from World War II. Now that the tentacles of the Nazi Empire have reached American soil, BJ Blazkowicz spearheads the resistance against cyborgs, Nazi goons and advanced über soldiers. 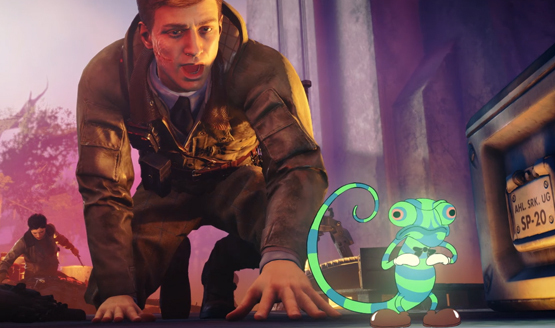 Make no mistake, this is a Wolfenstein game through and through, and you’ll be able to indulge in the franchise’s zany, over-the-top action via the reveal trailer up above. Untimely leaks threatened to spoil the surprise in the build up to E3 2017, but Wolfenstein is now ready to stage its comeback, and we couldn’t be more excited. It’s official: Wolfenstein II: The New Colossus will march onto PS4, Xbox One, and PC on October 27th. That’s a launch date it currently shares with Assassin’s Creed: Origins, so it’ll be interesting to see how MachinesGames’ Wolfenstein sequel fares against such stiff competition – particularly when you consider that Ubi’s clandestine juggernaut is returning after a one-year hiatus.